After briefly describing the origins of Islamic NGOs in Africa and the factors that boosted their growth during the last three decades, this chapter will discuss their notion of development and their understanding of basic development concepts such as the human rights and the needs’ approach. It will then review the strategic approaches used by Islamic NGOs to achieve development, using Somalia as a case study for confirming the nexus between migrations and the diffusion of Islamic NGOs in Africa, identified by Salih and Weiss, and for advancing the thesis that Islamic NGOs promote a private welfare system in developing countries. While the definition of a non-governmental organization (NGO) is commonly agreed in the West, the notion of Islamic NGOs is more controversial and surely wider in its scope. Some scholars refer to them as Muslim NGOs or associations, others as Islamic Social Institutions; their common denominator however is their faith-based character and the fact that they do not openly belong to the governmental apparatus. For this reason, for the purpose of this work, we will use the term Islamic NGOs and refer to the formal and informal organizations that carry out aid work on the basis of their Islamic faith, while using Islamic charitable funds. The phenomenon of Islamic NGOs began to emerge in Africa in the middle of the 1970s and went through a phase of exponential growth between 1980 and 2000 [Salih 2004]. The major factor in this growth was the economic crisis that affected African societies in the post-independence era, creating situations of humanitarian emergency. The crisis was caused by the oil embargoes of 1973 and 1979, imposed by Saudi Arabia and the Arab oil-producing nations in support of the war effort of Egypt, Jordan and Syria against Israel and her allies. In 1973 Saudi Arabia suspended the supply of oil as a retaliatory measure, causing a dramatic price rise. This led on one hand to severe economic crises in Africa and in the West, and on the other to an influx of enormous sums of money to the Arab oil-producing countries, part of which went to finance the Islamic humanitarian sector and its organizations. Thus the oil embargoes can be said to have produced the phenomenon of “Islamic humanitarianism”, mobilising religious associations to supply humanitarian aid and provide social services for the benefit of populations affected by the economic crisis. Economic crises, natural catastrophes and the numerous civil wars which plagued the African continent from the late eighties gave rise to a significant increase in the need for humanitarian aid among African populations. This increasing need coincided with a general withdrawal on the part of African countries from providing social welfare, due to the economic reforms imposed by the World Bank and International Monetary Fund. During the 1980s the African countries proved incapable of intervening in support of the victims of political and natural emergencies, and this left scope and opportunities for the Islamic NGOs to play a part in the provision of social services and humanitarian aid, above all in predominantly Muslim African nations. A second factor that favoured the emergence of Islamic NGOs was the development of the Islamist movements from 1979 onwards, following the creation in Iran of an overtly theocratic Islamic state under the Ayatollah Khomeini. The foundation of this Islamic state had important repercussions in the Arab world and triggered off the rise of Islamist movements in Africa too, with the aim of reforming the secular state and promoting a political vision of religion. This process has been described as the Islamic Resurgence by John Esposito, and subsequently by other authoritative scholars of Islam such as Jilles Kepel and Oliver Roy. The Islamic aid organizations developed in parallel with the Islamist movements, either as direct offshoots or as affiliated or supportive organizations, often to create sympathisers or to mobilise human and financial resources. The Islamic NGOs created in the Arab countries and in the Middle East took root in Africa thanks to the African diasporas. The process of migration towards the main countries that were fostering Islamist movements brought young Muslims from the African nations affected by the emergencies into contact with the nascent reforming ideals. When they returned to their countries these young Muslims formed associations to promote the new ideals, together with Islamic NGOs to provide humanitarian aid and basic social services. Thus the migratory processes and the African diasporas were fundamental factors in the spread of Islamic NGOs in Africa, as has been shown in the cases of Ghana [Weiss 2002] and Somalia [Saggiomo 2011a]. The growth of the phenomenon of Islamic NGOs gave rise to the need for a model of development in the Islamic world which was specific to the Muslim religion. Although there is a vast literature on the concept of social justice in Muslim societies, there does not yet seem to be a coherent notion of development on the part of Islamic NGOs [Kroessing 2008]. This notion relies above all on the precepts indicated by the Prophet in the Koran, and in particular on the two fundamental principles of improving economic conditions and social justice [Ansari 1994]. The concept of social justice involves in practice the question of human rights, as defined in the Universal Declaration of 1948. The need to develop an Islamic version of the Declaration on Human Rights became a topic of widespread debate in the 1970s, at the instigation of the Organization of the Islamic Conference, the NGOs in the Arab-Islamic world and the Islamic movements of political opposition. The latter above all were motivated by the urge to denounce the violations of human rights in those countries with a Muslim majority where liberties were curtailed, above all with respect to civil and political rights [Pace 1992]. The need of these movements to oppose dictatorial tendencies and find an Islamic version of the Western concepts paved the way for a debate on human rights in the Muslim world. In 1977, two years before he died, Abul Mawdudi published Human Rights in Islam in Pakistan. This book sets out the fundamental rights as envisaged in the Koran, starting from the right to life, which pertains to each individual irrespective of religious allegiance, and including the civil and political rights recognised in an Islamic state [Mawdudi 1977]. Mawdudi was critical of what he explicitly referred to as Western cultural imperialism enacted by means of the international conventions, leading to criticism of the Universal Declaration on Human Rights by such nations as Pakistan, Iran, Saudi Arabia and Sudan. In 1981, at the UNESCO in Paris, the European Islamic Council proclaimed the Islamic Declaration on Human Rights, superseded nine years later by the Cairo Declaration on Human Rights in Islam. In Cairo the member states of the Islamic Conference agreed to a series of key principles concerning the central role of the Islamic religion in discussions of human rights, expressed in the Koran and hence inviolable: the need to combine material progress with the Islamic faith, and the right of individuals to assert their liberty and dignity, as indicated in the Sharia. Apart from the supremacy of Islamic law over the principles of human rights, there is in fact little difference between the Islamic and Universal Declarations on Human Rights, notably regarding the whole question of civil and political rights. The terrain was now fertile for a debate in the Muslim world as to how Islam should view development and what were the appropriate means to achieve it. During the 1990s, possibly spurred on by debates taking place at the United Nations on the concept of human growth and sustainable development, Muslim intellectuals and scholars began to highlight the lack of an Islamic notion of development and the related concepts. How is Need to be defined under Islam? In the 1990s the attempt to arrive at an Islamic notion of development meant above all defining the concepts of human poverty and need as they were currently being debated. In 1994, Mohamed Ansari, after commending the notion of sustainable development to have emerged from the Rio conference on the environment, proposed an Islamic counterpart, its main aim being to achieve peace and harmony at all levels of human existence. More specifically, Ansari applied the aim to three dimensions of human existence: peace and harmony with oneself, highlighting the spiritual aspect of sustainable development, but at the same time implying the fulfilment of material needs; peace and harmony between man and in society, emphasising the realization of the concept of social justice as it is articulated in Muslim thought; and, last but not least, peace and harmony with God and his creation, echoing the Western vision of sustainable development in the sense of the obligation on the part of human beings to safeguard the resources of the natural world for future generations. When Muslim intellectuals turned their attention to what makes it impossible to achieve peace and harmony in the dimensions set out by Ansari, poverty was identified as the prime obstacle to development, since poverty generates inequalities and social tensions between «those who have much and those who have nothing» [Hasan 2006]. How is the concept of poverty articulated in Islamic thought? In 1996 Syed Othman Alhabshi defined poverty as the condition for which the individual is not able to fulfil his or her own human needs. He was clearly adopting the terminology of the ongoing international debate and the relative concepts, but nonetheless in an Islamic perspective which classed human needs according to five all-inclusive dimensions: the need for faith, seen as the prime need of the individual inasmuch as this defines the ultimate goal of human life, together with moral values and the behavioural norms which must be respected; then come the material needs which make survival possible, namely for food, water, health and shelter; the needs of the intellect and knowledge, including the knowledge of the Koran and religious rituals; the need for procreation, in order to propagate the human race; and finally, the need for wealth. Under Alhabshi’s approach, when individuals do not have the possibility of achieving these needs, they are to be regarded as poor. This interpretation has been accepted and promoted by various Islamic NGOs, including Islamic Relief: when this organization officially adopted it in 2008 [Islamic Relief 2008], it made a distinction between poverty and indigence, in the sense of an absolute need for assistance in order to survive. This distinction makes it possible for Islamic NGOs to prioritize interventions of assistance and support for development, in line with the indications of the Koran. Towards the end of the 1990s the Islamic notion of development thus tended to be defined negatively, in terms of what it was not (referring to the condition of poverty), and positively in terms of the struggle against poverty and fulfilment of the fundamental needs, interpreted under the Islamic religion as the achievement of peace and harmony at the individual and collective levels. We can identify more recent considerations of the notion of development from an Islamic perspective in the debates taking place on line between communities of the faithful and Imams who offer their expertise concerning the correct application of the precepts laid down in the Koran in modern times. These discussion forums, which often function as blogs or question and answer sessions, are intended for a vast audience including Muslim aid workers employed by international NGOs, officials working for Islamic NGOs, students and young people in general. This is perhaps the most up-to-date source for observing the ongoing debate on development seen from an Islamic perspective. In 2004, in a blog on the site Islamonline, Muzammil Siddiqi, former President of the Islamic Society of North America, confirmed the interpretation given by Mohamed Ansari of the Islamic notion of development. The ultimate goal of development for Islam is the achievement of peace and harmony, but Siddiqi also argued that special attention should be paid to the notions of justice and prosperity. For the Islamic religion, development has to be viewed in a material, cultural, political, moral and spiritual sense all at the same time. Without spirituality and morality, Siddiqi insisted, economic growth is harmful for individuals and nations alike. While the literature we have analysed undoubtedly gives some insights into the notion of development in Islam, the ways in which the objectives should be achieved emerge more clearly from the practice of Islamic NGOs than from the theory. As we have said, proper theoretical bases have not yet been consolidated, but observing the way in which Islamic NGOs operate in poor countries to promote development processes does enable us to identify benchmarks or examples of good practice that have been adopted by Islamic NGOs over the last twenty years. These have been described in studies relating to Asian realities; the «Individual Oriented Approach» [Alhabshi 1996] was adopted by the Malaysian Islamic NGO Amanah Ikhtiar Malaysia (AIM) at the end of the 1980s and subsequently applied extensively with a substantial contribution from the Malaysian government. This approach was preceded by a research project financed by government funds and conducted jointly by two Malaysian universities, the Islamic Economic Development Foundation of Malaysia and the Asia Pacific Development Corporation. The research findings led to the elaboration of a strategy for combating poverty based on interpretation of the Koran and the relevant practices proposed by the Prophet. This strategy was based on a story from the life of Mohamed in which the Prophet proposed to a beggar to buy everything he had if he would then invest all the money he received in order to generate more; the story ends happily, with the man who had initially been forced to beg for alms becoming the agent of his own individual development thanks to the money put at his disposal by the Prophet. This parable became the leitmotiv for the strategy proposed by the study group and put into practice by the NGO AIM, promoting projects of micro-credit in restricted areas of the country, at first as a pilot scheme. In fact micro-credit was considered the equivalent of the strategy adopted by the Prophet, able to help individuals break out of the poverty trap. When this approach is used to set up small-scale private businesses it does indeed feature all the elements set out in the holy scripture, including durability and the primary focus on individuals and self-help. The development model elaborated by AIM proved able to help 40.000 people in 1996 to break out of the poverty trap, and was subsequently supported by numerous banks and financial holdings. Religious texts actually provide many indications of the importance for actions promoting development to be durable and sustainable in order to be pleasing to God. As Jamal Krafess pointed out in his study of references in the Koran to carrying out humanitarian and development interventions in poor countries [Krafess 2005], the Prophet referred explicitly to the durability of the effects of charitable actions, symbolised by the act of giving a she-camel able to produce milk and breed other animals. Krafess equates this symbolic act to the standard practice among many Islamic NGOs of donating material goods which can have a lasting impact on beneficiaries in countries like India, Bosnia Herzegovina and Somalia. Thus giving livestock and providing interest-free loans are two very common practices among the Islamic NGOs which wish to empower individuals who are enduring poverty and enable them to free themselves from this condition by their own efforts. This approach, applied on a large scale, could have a significant, long term effect on the condition of poverty that stops a society embarking on development. The Malaysian development model, seen as pertaining to the Islamic religion, has been analysed by another Asian scholar, Ahmad Samiul Hasan. His contribution to the debate was the concept of «strategic philanthropy» as a specific characteristic of the Islamic religion. Malaysia is one of the states where the collection and redistribution of zakat is centralised. In his observation of the redistribution mechanisms of zakat by the Malaysian government, Hasan remarked that, rather than dispersing the funds for the needy in micro-donations, the government conformed to the indication given in the Koran to make the receiver of the aid rich, so as to enable him to purchase the means for providing himself with a trade [Hasan 2006]. In fact there are many similarities with the system promoted by Mohamed Yunus in Bangladesh in the mid-seventies which led to the creation of the Grameen Bank in 1976, the only bank willing to distribute micro-loans to poor people even though they could give no guarantees of being solvent. The rate of restitution of the credit loans was extremely high in the case of the Grameen Bank thanks to a mechanism which spread the burden on a group of beneficiaries rather than on the single individual, as is also the case in the Malaysian model. This enabled the Grameen Bank to grow to such an extent that in 1997 there were 12.000.000 beneficiaries of its credit in Bangladesh and the rest of the world [Yunus 2001]. In 2006 Mohamed Yunus was awarded the Nobel Peace Prize for his contribution to alleviating human suffering and poverty with the mechanism of micro-credit. In addition to the promotion of micro-credit for activities to enhance income, there are various other initiatives which adhere to the precepts of the Koran and represent key sectors for the intervention of the Islamic NGOs. A study carried out by Ajaz Khan Ismail Tahmazof and Mamoun Aburqub [Islamic Relief 2009a] on the annual reports and internet sites of the Islamic NGOs registered with the Charity Commission in Britain lists three principal initiatives: the provision of food to the poor during the month of Ramadan and religious festivities in general; support for orphans, reflecting the historical fact that the Prophet himself was an orphan; and the supply of water by drilling wells. Each of these intervention sectors has a theological motivation and justification that can be traced back to the Koran or the tales of the Prophet, as Jamal Krafess pointed out in his interesting study of the religious bases for humanitarian action as carried out by Islamic NGOs [Krafess 2005]. It may well be precisely on account of the still sketchy theorization of development strategies in Islam that Islamic NGOs tend to favour the implementation of humanitarian interventions on a brief timescale rather than long term development schemes, as Ajaz Khan Ismail Tahmazof and Mamoun Aburqub point out in their 2009 study Translating Faith into Development [Islamic Relief 2009b]. The development strategies we have reviewed so far are reflected in the action of Islamic NGOs in Somalia, committed both to providing humanitarian aid and to developing initiatives able to generate income. Unlike in Bangladesh or Malaysia, where the activities designed to generate income contribute to fuelling a local economic sector, in the case of Somalia they focus on the development of the social services sector in the country’s urban areas, as can be seen in the following case study. In Somalia the presence of Islamic NGOs corresponds to the pattern described above, with an important role being played by the neighbouring Arab countries, in particular Saudi Arabia. With the entry of Somalia into the Arab League in 1974, Arab countries began to supply aid to the country whether as bilateral donations known as ODA (official development assistance) or by means of internal policies designed to assist Somali refugees driven out of their homeland by economic motives or political persecution. The role of Arab countries as international donors for development took on a considerable significance from the 1970s. This was due largely to the increase in oil prices in 1973 and 1979 and the corresponding profits which were channelled into the foreign policy of the oil-producing nations as ODA. The foreign policy of these nations in this period aimed primarily at promoting their commercial interests and spreading a predominant religious model, above all in the case of Saudi Arabia. Up until the end of the 1980s, the principal donors among the Arab countries were Kuwait, Qatar, Saudi Arabia and the United Arab Emirates; they paid specific attention to the Middle East, and Syria and Jordania in particular. The provision of Arab aid was not constant: at the beginning of the eighties there was a peak in donations, corresponding to 4.7% of Gross National Product [Villanger 2007]. Then in 1989 the fall in the price of oil, associated with devaluation of the American dollar, caused a marked decline [Van der Boogaerde 1990], rising again from 1990 in response to the war between Iraq and Kuwait only to fall off sharply in 1992 [Zubair 1994]. In Africa, Arab donors granted bilateral ODA above all to Egypt, followed by Morocco, Sudan, Mauritania, Somalia, Tunisia and Algeria [Van der Boogaerde 1990]. Somalia, from 1974 and for the next ten years, constantly received aid from Arab countries. 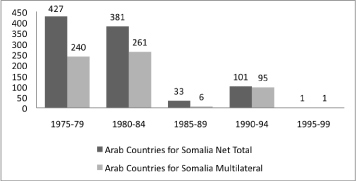 From the mid-eighties, and through to the fall of the central government, the bilateral contributions of Arab countries for Somalia diminished until they virtually ceased, only to pick up again in the period of crisis which went from the fall of the government to the conclusion of the UNOSOM mission. The failure of the latter marked the complete withdrawal of support by Arab countries for Somalia. The graph given below shows the ODA from Arab countries for Somalia from 1975 to 1999: for convenience it is represented in five macro-periods, which correspond more or less to the rise and fall of the Siad Barre government and thereafter to the presence of humanitarian peace missions in the country. In addition to the bilateral and multilateral channels, since 1990 ODA from Arab countries has also been distributed to charitable organizations, Islamic NGOs created under the auspices of the government, and above all the organizations of the Red Crescent [Cotterrell, Harmer 2005]. The current trend also seems to benefit humanitarian aid rather than development programmes, and there has been an increase in non-monetary donations such as food, medicines, equipment and means of transport. In Somalia, following the fall of the Siad Barre regime in 1991 and the subsequent power struggle and civil war, two rounds of peace negotiations were held at Djibouti in June and July 1992 to put an end to the political and humanitarian crisis that was racking the country. The United Nations Security Council resolution of 3 December 1992 launched the operation “Restore Hope”, under the military leadership of the United States with the United Nations supervising humanitarian aid. For the latter Saudi Arabia was one of the most sympathetic donors, sending 4.000 tons of food. The troops in the military contingent included soldiers from Arab countries with Muslims in the majority, including Egypt, Morocco, Pakistan, Saudi Arabia, the United Arab Emirates and Kuwait. This encouraged Islamic NGOs to participate, contributing to the humanitarian aid missions for which the international contingent was providing protection [Abdullahi 2010]. During the period corresponding to the UNOSOM missions, Arab countries contributed almost the whole of their aid through the multilateral channel, and in particular through Regional funds. Some organizations also received funding from Arab sources, such as the Somali Red Crescent Society, as a member of the Federation of the Red Cross and Red Crescent, the Saudi Islamic NGO IIRO, affiliated with the NGO Rabidat Alum Islamiya, the Saudi World Association of Muslim Youth (WAMY), which had been supporting Somali refugees in Kenya since 1991, the Kuwaiti NGO Africa Muslim Agency (AMA), which began to contribute in 1992-1993, the Sudanese Munazzamat al Dawa al Islamiya which arrived in Mogadishu in 1992, and the Red Crescent Society of the United Arab Emirates which was active not only in the health sector but also in primary education. Shortly after the beginning of the civil war the Somali Islamist movement Al Islah, created in Saudi Arabia by exiles fleeing political persecution under the regime of Siad Barre, invited its members living in neighbouring Arab countries to return to Somalia to run Islamic NGOs affiliated with the Muslim Brotherhood [Hansen Mesoy 2009] and to found local Islamic NGOs to tackle the humanitarian emergency. The development of local Islamic NGOs in Somalia, a phenomenon that Al Islah has dubbed Al Igatha wa Taclim or «the effort for humanitarian and education operations», was motivated by the desire to bring an end to the humanitarian crisis caused by the war from 1990 onwards. The first to mobilise in order to create structures and operations of humanitarian aid were victims of the humanitarian emergency themselves, with the external support of the movement, so as to place themselves and their families out of range of the fighting. In 1991 the Al-Islah Charity was set up, as an internal organ of the movement that was dealing with humanitarian and educational issues. The President of Al Islah Charity was Abdulkadir Mohamed Qutub, charged with fund raising and supervision of the projects of primary and secondary education. This development model for associations, which made no distinction between the Islamist movement and the Islamic NGO created to further the humanitarian goals, was soon abandoned in favour of another model for promoting Igatha wa Taclim, constituting Islamic NGOs which were external to the movement but affiliated with it. Now the aim was to mobilise those members of Al Islah that had stayed in the country, representing in some ways an élite in terms of both economic and socio-cultural standing. These were in fact people with a high level of education who often had relations living abroad and were able quickly to activate the necessary mechanisms for ensuring survival in the face of famine and the civil war. For these people it was not difficult to set up a local NGO and hence to contribute to the reconstruction of the country’s social system. This led to the foundation of such local Islamic NGOs as the Zam Zam Foundation, Al Tadamun, and the Imam Shafi’i Foundation. These local Islamic NGOs were, on one hand, the expression of a specific desire on the part of the movement’s leadership and on the other the outcome of the reaction of the members of Al Islah to the destruction brought about by the civil war. While it is true that most of the Islamic NGOs that arrived in Somalia from abroad came in the wake of the United Nations intervention and the participation of their countries in the UNITAF contingent, it is also true that the Somali diaspora played an important role in the mobilisation of Islamic NGOs in the countries that hosted this diaspora. According to Abdurahman Moallim Abdullahi, one of the principal leaders of Al Islah, it was above all the people he refers to as enlightened figures in the Somali diaspora who alerted and mobilised the humanitarian organizations to play an active role in Somalia [Abdullahi 2004]. In fact the movement mobilised members living abroad who had previously been invited by the organization’s leadership to link up with the major Islamic NGOs in the host countries. From 1992-1993 the members of Al Islah scattered throughout the diaspora returned to Somalia at the head of foreign Islamic NGOs. Abdurahman Moallim Abdullahi returned from Canada to head the NGO Mercy-USA and Farah Sheikh Abdulkadir came from Kuwait to run the Islamic NGO Africa Muslim Agency. The latter organization had begun its activities in Somalia in 1987, before the outbreak of the civil war, but on the invasion of Kuwait by Iraq in 1990 it was obliged to close down its offices and programmes. It only returned to the country in 1992, first to pursue projects of humanitarian aid in Mogadish and then others in primary education, setting up numerous primary schools and institutions of higher education. Mercy USA is an American NGO formed by figures in the Somali diaspora which, although not overtly Islamic, finances its activities in part from religious funding. Furthermore, in 1993 the British Islamic NGO Muslim Aid, while not necessarily linked to Al Islah, arrived in Somalia, opening an office in Mogadishu and implementing programmes for education, health and water supply, in partnership with other Islamic NGOs and the World Food Program, as well as setting up two centres for maternity and infant assistance in Kisimayo. The mobilisation of the members of the movement who were resident abroad did not only involve the foreign NGOs. The medical doctor Ibrahim Dusuqi, for example, returned to Somalia from Saudi Arabia to contribute to Al Islah’s Igatha wa Taclim by developing health projects with the local NGO Zam Zam. This led to the foundation of the Osoble Hospital and Arafat Hospital, both under the management of Dusuqi. These are training hospitals and centres for social assistance which do not claim to be Islamic but whose creation is closely linked to the strategy of social development put in place by the Islamist movement Al Islah. Capitalising on the fact that there was no government hostile to their social and political aims, the Islamic NGOs played a fundamental role throughout the 1990s in providing social services and humanitarian aid in a war-torn Somalia. When they first started operating in the country, with the economic backing of Arab donors and the humanitarian division of UNOSOM, they focused almost exclusively on humanitarian aid. Like all the NGOs present on the territory, they distributed foodstuffs, set up nutritional centres to monitor the state of malnutrition among adults and children in the period immediately after the famine of 1992, and saw to the provision of drinking water. From the end of 1994, when the UNOSOM forces began to be scaled down, causing security in the capital to degenerate, the international NGOs and the United Nations agencies moved out of the south of Somalia and transferred to nearby Nairobi, from where humanitarian aid and support for the country’s pacification continue to be administered. Many organizations abandoned Somalia for good, often turning to the new process of reconstruction in Bosnia Herzegovina in 1995 or to the humanitarian emergency in Rwanda in 1994. Together with the last UNOSOM contingent, in March 1995 the media too left the country, casting a pall of oblivion over the grave situation of conflict that remained. Once Somalia was no longer in the spotlight, the economic engagement of donor countries to face up to the humanitarian emergency and underwrite the reconstruction programmes also faded away. In the five-year period from the end of the UNOSOM mission to 1999, the ODA for Somalia from Arab countries dropped from about 100 million dollars in the preceding five-year period to little more than 1 million dollars, all of it, at least officially, being made over to the United Nations [OECD statistics]. The local and international Islamic NGOs were the only organizations left in Somalia to cater for the needs of the population, in the grip of a humanitarian emergency [Farah 2004]. In particular, those NGOs which were not necessarily dependent on international help remained active, and they managed to mobilise human and financial resources from both within and outside the country, drawing on the Somali diaspora dispersed worldwide. Nonetheless the shortfall in funding obliged many Islamic NGOs to reduce their interventions and select the type of assistance to offer on the basis not only of local necessity but also, and above all, of the desire for reconstruction which from the mid-nineties onwards began to take root among the aid associations present in Somalia. The purely humanitarian sector relying primarily on assistance thus came to be neglected in favour of more structured and lasting interventions designed to create social services for the population, above all in the education and health sectors, but also in the promotion of peace and mediation between the factions in conflict. As Sheikh Farah Abdulkadir stated, after the failure of the UNOSOM mission, in 1994 private schools were set up and supported by both Islamic and foreign charities which were then moving into Somalia. This involved in particular the Kuwaiti AMA, of which he was the representative for Somalia, the Saudi IIRO, the Red Crescent Society, Africa Relief Committee and Sudanese Munazzamat al DAWA, all working in collaboration with local organizations. These charities received financial support from their headquarters but launched schemes to make the schools financially sustainable, in collaboration with the local communities, so that the reference NGO could gradually reduce its support for the management costs of the schools until the school achieved complete financial and administrative viability in the space of three years. The strategic partnership with the local communities thus represented one of the cornerstones of the operating modalities of the Islamic charities, together with training of the personnel, teachers included, and the principle of non alliance with the political factions. The void created by the absence of the Western NGOs and the sudden loss of interest in Somalia on the part of the international community was thus in part filled by the Islamic NGOs which took over responsibility for reactivating the fundamental social services by involving Somali professionals and the civil society [Abdulleh 2008]. Moreover, the withdrawal of the Western NGOs provided an excellent opportunity for the Islamic NGOs to extend their workforce, taking on Somali humanitarian operators who had been trained by the international organizations and suddenly found themselves out of a job [Le Sage, Menkhaus 2004]. The population thus came to count almost exclusively on the religious structures, mosques, Islamist groups and Islamic NGOs for aid and in order to begin to reconstruct the country, and this marked the true beginning of consensus-building and the legitimacy of the Islamist movement Al Islah in Somalia, as indeed of all the associations with a religious matrix. The creation and diffusion of the Islamic NGO sector appears to have been favoured by two important factors: the aid funds of Arab countries and the migration flows from Africa to Arab countries and back to Africa. The Arab world played a major role in contributing to the creation and diffusion of the Islamic NGOs in Africa after the profits of the 1973 and 1979 oil crises began to be channelled into foreign policy also though Official Development Assistance funds. Arab countries became eager to fund Islamic NGOs for humanitarian assistance and also development initiatives when African states, that had been heavily hit by the consequences of the Structural Adjustment Programs promoted by the World Bank and the International Monetary Fund, were unable to provide sufficient social services for the population. To the African population in need, the NGO sector, both faith-based and secular, represented the sole actor that was willing and financially able to address their needs; the availability of aid funds from Arab countries and the extreme need of assistance by populations in the wake of civil wars or the lack of social services led to the widespread diffusion of the NGO phenomenon in general, and the Islamic NGOs in particular, especially in Muslim majority countries. The case study of Somalia confirms the dynamics of development and dissemination of Islamic associative activity in Africa observed by Mohamed Salih, and by Holger Weiss in the case of Ghana. For Weiss, these dynamics reflect above all a need for humanitarian assistance on the part of the African populations in the 1980s and a corresponding impulse among the Islamist movements to set up associations with a religious matrix that gave rise to the constitution of numerous Islamic NGOs in Arab countries with a Muslim majority. In the existing literature the dissemination of Islamic NGOs is shown to reproduce the migratory flows of the African populations towards the rich, oil-producing countries, mostly Arab, and took concrete form in the return of migrants to their homeland. These dynamics, described by Weiss in the case of Ghana, are now confirmed for Somalia, the subject of this study. The migrations triggered by economic hardship and political persecution by Siad Barre’s dictatorial regime brought numerous religious exponents, young businessmen and students into contact with the reformist ideas of the Muslim Brotherhood first in Egypt (in the 50s and 60s) and then in Saudi Arabia (70s and 80s). The dissolution of the Somali state, which collapsed officially with the deposition of Siad Barre in 1991, finally cleared the way for the return of this human capital, for both humanitarian and political motives. In this way the Islamic NGOs entered Somalia financed and supported by the neighbouring Arab countries, often guided by Somali personnel issuing from the diaspora, just as Islamist movements set up abroad returned to their homeland, stimulating the creation of a local network of Islamic NGOs. As for the role taken on by the Islamic NGOs in Africa from the 1980s onwards, on one hand they sought to provide humanitarian assistance and social services for the populations in the thrall of political emergencies or natural catastrophes; and on the other hand they disseminated the Islamist ideology and in particular the reformist ideas of the Islamic state in African society, above all where there was a Muslim majority. According to some scholars, the re-Islamization of the countries with a Muslim majority could count on the work of a substantial number of organizations, including the Islamic NGOs, engaged in defending Islamic values and social justice, which find expression, in the jargon of international cooperation, in policies of development and social welfare. In Somalia too, for the best part of the 1990s, Islamic NGOs responded above all to humanitarian needs in a country torn by conflict, distributing food and carrying out emergency programmes. Subsequently, starting from the mid-nineties, they turned their attention increasingly to the fundamental social services sector, above all education and health. By beginning to work jointly they managed to create networks of associations as an expression of the organized civil society, able to orient the policies to be adopted for the fundamental social services. One example of this is Islamic primary schools, whose curriculum and system of exams and certification are overseen by the FPENS network rather than by the transition government’s Ministry of Education [Saggiomo 2011b]. Thus in what terms do the Islamic NGOs speak of development? While this subject surely needs more attention by scholars and academics, initial research on Somalia seems to show a push towards private initiatives in the social service sectors, especially in health and education. Private schools and hospitals have mushroomed in and around Mogadishu and the urban areas of the country; their services are paid for by the well-off Somali population and their quality is generally appreciated and valued. The case of Somalia resembles some Asian countries in which research went into which strategies were appropriate for achieving a truly Islamic form of development. In the standard practice of many Islamic NGOs this is taken to mean the development of the economic sphere of individuals in need, as well as the spiritual sphere of course. Thus management-based initiatives are financed by means of micro-credit, and such fundamental social services as water supply, hospitals and schools, are developed, here too as private initiatives. As was described above, the work of the Islamic NGOs in Somalia from the second half of the 1990s was primarily oriented along these lines, and the absence of a government that could condition its operations favoured the consolidation and dissemination of the associations with a religious matrix and of the Islamist movements associated with these associations. Abdullahi A. M. 2004, Non State Actors in the Failed State of Somalia. Survey of the Civil Society Organizations during the Civil War (1990-2000), «Diraasat Ifriquiyya», 31: 57-87. – 2010, The Islah Movement in Somalia: A historical evolution of the Islamic moderation, Montréal: McGill University. Abdulleh J. I. 2008, Civil Society in the Absence of a Somali State, in Heinrich Boll Foundation (ed.) 2008, Somalia. Current Conflicts and New Chances for State Building, Berlin: Heinrich Boll Foundation, 70-87. Ansari M. 1994, Islamic Perspective on Sustainable Development, «The American Journal of Islamic Social Sciences», 11 (3): 394-402. Benthall J., Bellion-Jourdan J. 2003, The Charitable Crescent. Politics of Aid in the Muslim World, London-New York: I.B. Tauris. Cotterrell L., Harmer A. 2005, Diversity in donorship: the changing landscape of official Humanitarian aid. Aid donorship in the Gulf States, London: Humanitarian Policy Group Background Paper. De Waal A., Salam A.H. 2004, Islamism, State Power and Jihad in Sudan, in De Waal A. (ed.) 2004, Islamism and its Enemies in the Horn of Africa, Bloomington, Indiana: Indiana University Press, 71-113. Farah K. H. 2004, The Role of Islam in Peace Building and Conflict Resolution in Somalia, in Ford R., Adam H., Ismail E. 2004, War Destroys, Peace Nurtures. Reconciliation and Development in Somalia, Asmara: The Red Sea Press, 301-314. Hansen S. J., Mesoy A. 2009, The Muslim Brotherhood in the wider Horn of Africa, Oslo: Norwegian Institute for Urban and Regional Research (NIBR). Islamic Relief 2008, Definitions of Poverty, Birmingham: Islamic Relief Worldwide. – 2009a, A Brief History of Humanitarism in the Muslim World, Birmingham: Islamic Relief Worldwide. – 2009b, Translating Faith into Development, Birmingham: Islamic Relief Worldwide. Krafess J. 2005, The Influence of the Muslim Religion in Humanitarian Aid, «International Review of the Red Cross», 87 (858): 327-342. Le Sage A. 2007, Islamic Charities in Somalia, in Alterman J. B., Von Hippel K. (eds.) 2007, Understanding Islamic Charities, Washington: CSIS, 147-167. Le Sage A., Menkhaus K. 2004, The Rise of Islamic Charities in Somalia. An Assessment of Impact and Agendas, Paper presented to the 45th Annual International Studies Association Convention, Montreal, 17 - 20 March 2004. Mawdudi A. 1977, Human Rights in Islam, Lahore - Pakistan: Islamic Publications Limited. Saggiomo V. 2011a, Soccorrere e Governare. Le ONG islamiche e la ricostruzione dello Stato in Somalia, Napoli: Università L’Orientale di Napoli. – 2011b, From Charity to Governance. Islamic NGOs and Education in Somalia, «The Open Area Studies Journal», 4: 53-61. Sahnoun M. 1994, Somalia. The Missed Opportunities, Washington D. C.: United States Institute of Peace Press. Salih M. 2004, Islamic NGOs in Africa: the Promise and Peril of Islamic Voluntarism, in De Waal A. (ed.) 2004, Islamism and its Enemies in the Horn of Africa, Addis Abeba: Shama Books, 146-181. Van der Boogaerde P. 1990, The Composition and Distribution of Financial Assistance from Arab Countries and Arab Regional Institutions, Washington D. C.: International Monetary Fund, Middle East Department Working Paper. Villanger E. 2007, Arab Foreign Aid: Disbursement Patterns, Aid Policies and Motives, CMI Reports. Weiss H. 2002, Reorganising Social Welfare among Muslims: Islamic Voluntarism and other Forms of Communal Support in the Northern Ghana, «Journal of Religion in Africa», 32 (1): 83-109. Yunus M. 2001, Il banchiere dei poveri, Milano: Feltrinelli. (Ed. Orig. : Vers un monde sans pauvreté, Paris: Lattès). Zubair I. 1994, Arab Development Assistance: Role of Development Funds and Support for Multilateral Financial Institutions, in Bretton Woods Commission (ed.) 1994, Bretton Woods: Looking to the Future, Washington D. C.: Bretton Woods Commission, 249-256. The reason for choosing Somalia as a case study is more personal than academic: the author worked in Somalia in the international cooperation sector for four years and has seen at first hand the work and commitment of many local and international Islamic NGOs. This experience and the contacts established in Somalia and in Nairobi made it possible for me to interview prominent Islamist leaders and Islamic NGO members. See definition by the United Nations in 1945 and subsequent updates. Mohamed Salih put growth at 640%. The Yom Kippur War in 1973. Mohamed Salih relates these factors to a crisis of governance, with the government incapable of administering or maintaining order throughout the national territory. The politicization of the religious sphere is known variously as Islamic Resurgence, Islamic Revivalism, Political Islam, Islamism and, as described by Asef Bayat, Islamic Activism. Some of the exponents of this political vision of the Islamic religion call themselves Reformers, implying a political project for reforming the secular state. Among the factors that produced the phenomenon of Islamic NGOs worldwide, Jonathan Benthall emphasizes the opposition to the Israeli-American dominion of the Muslim world. From 1967, when Israel occupied the West Bank, the Gaza strip, East Jerusalem, the Egyptian Sinai and the Syrian Golan Heights, this opposition found expression in numerous resistance movements and related Islamic associations. See Benthall J., Bellion-Jourdan J. 2003, The Charitable Crescent. Politics of Aid in the Muslim World, London-New York: I.B. Tauris. Arab countries are taken to be the countries that belong to the Arab League, with particular reference to the oil-producing countries that have financed aid schemes for development in Africa. In his study of Ghana Holger Weiss prefers the term Muslim NGOs to Islamic NGOs. He accounts for the rise of Muslim social services as a reaction by the Muslim world against the spread of health, education and social welfare facilities brought by Christian missionaries. See the publications produced as part of the research project Religions and Development coordinated by the University of Birmingham. E.g. the Islamic Salvation Front in Algeria. Sayyid Abul A’la Mawdudi, (1903-1977), born in India, was an eminent Islamist scholar who taught in Lahore, Pakistan and published over hundred books and other writings. He was ideologically affiliated to the Muslim Brotherhood and influenced by Hassan al Banna. Mawdudi’s approach to political Islam had a great influence on al Banna’s successor, Sayyid Qutb. The European Islamic Conference was set up in London in 1973, at the instigation of the diplomat Salem Assan, as a network of scholars and politicians from the Arab-Islamic world to formulate a position on issues central to Western thought such as democracy and human rights. Nowadays numbering 57 nations, including Iran, Pakistan and Somalia. We refer to the UNDP Human Development Report 1990 and the discussion of sustainable developments that ensued at Rio de Janeiro in 1992. See Ansari 1994 and Alhabshi 1996. Mohammad Ansari teaches Political Economics at the Athabasca University, Canada. Syed Othman Alhabshi teaches Islamic Economics in various Universities in Malaysia. He has worked for the Islamic Economic and Development Foundation in Malaysia for 10 years, and the Institute of Islamic Understanding. Muzammil Siddiqi, born in India in 1943, is a well known Muslim intellectual, theologist and Imam. He graduated in Saudi Arabia and received a doctorate in Comparative Religion from Harvard, where he lives. For this essay we have only analyzed texts available in English. Jamal Krafess is Director of Islamic Relief, Switzerland. The Charity Commission of England and Wales is responsible for registering and supervising all the religious organizations on its territory. It maintains a register of charities in the various regions and monitors and controls their activities. The data relating to Arab donors are taken from a study commissioned by the British Department for International Development (DFID) for the international conference Development Partners 11-12 November 2008, Nairobi, Kenya. According to statistics produced by OECD, in 2004 the major Arab donors to Somalia were, in order, Saudi Arabia, Arab Emirates and Kuwait. The OECD has no data for Arab donors to Somalia for the years after 2004. Data on public aid for development from Arab donors to Somalia covering the period 1975 -1999 come from OECD Statistics. After Somalia it became standard practice to follow up the despatch of troops from specific countries with the presence of NGOs from the same countries with government funding to deal with humanitarian aspects and aid distribution. As reported by Abdurahman Moallim Abdullahi, ex member of the Somali national army, then living as a refugee in Canada. The five most important regional funds are: Islamic Development Bank (IDB), the largest of the five, Arab Fund for Economic and Social Development (AFESD), Arab Bank for Economic Development in Africa (BADEA), OPEC Fund for International Development, and Arab Gulf Program for United Nations Development Organizations (AGFUND). Rabidat is often referred to using the English name Muslim World League (MWL). Le Sage  has claimed that the International Islamic Relief Organization (IIRO) and Rabidat are in fact one and the same organization. In reality, as transpires from the IIRO website, it is a separate body, affiliated to the MWL. 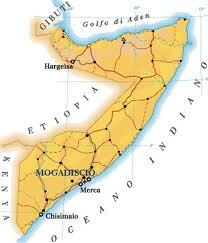 IIRO has been present in Somalia since the war with Ethiopia for possession of Ogaden. Interview with Ibrahim Irshad, Representative for WAMY-Kenya, Nairobi, 9 May 2008. Interview with Abdi Hussein Abdi, AMA, Nairobi, 14 May 2008. For further information on the activities of Munazzamat al Dawa al Islamiya in Sudan, see De Waal A. and Salam A.H. 2004. Two people lost their lives: the Vice-President Ali Mohamed Ibrahim Dayar on 8 January 1991 and the engineer Cisse, who was the political analyst for the movement in November 1991 [Abdullahi 2010]. In actual fact Al Islah Charity was founded before the fall of the regime, but during the civil war it was largely inactive for lack of proper coordination. It was revived during a meeting at the Al-Aqsa school in Mogadishu as a medical task force, and established in 1993 as a recognized charity [Abdullahi 2010]. This biography of Abdurahman Moallim Abdullahi “Baadiyow” was compiled with his help in an exchange of letters in November 2010. Interview with Hussein Muktar Mohamed, Muslim Aid – Kenya, and Mohamed Mohamud “Dahir” Shombe, Programme Officer in Somalia. Nairobi, 23 May 2008. Actually the United Nations always kept their offices in Somalia open, albeit with a reduced staff, made up above all of local operators with no decision-making powers. The management level is still today based in Nairobi, while the local staff have executive functions. Interview with Sheikh Farah Abdulkadir, Director of AMA Somalia in 1994. Nairobi, 28 July 2008. I should make it clear that the two French NGOs Médecins sans Frontières and Action contre la Faim did not leave Somalia at the end of the UNOSOM mission. Including Mohamed Salih [Salih 2004].